Leen Yassine | The Phoenix Graduate and undergraduate students protest in Damen April 4. 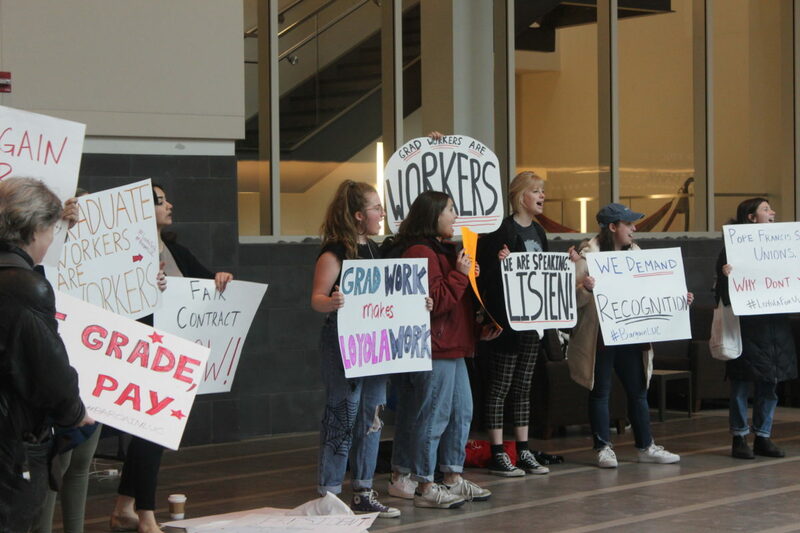 Loyola graduate student workers in the College of Arts and Sciences protested in the Damen Student Center Thursday to call for union recognition and a contract with the university. The graduate student teaching assistants voted to unionize two years ago but haven’t been recognized by Loyola. The National Labor Relations Board has recognized the union since its inception, but Loyola’s been firm in its position that graduate workers are students, not employees. Graduate students disagree. Along with being students, graduate assistants teach classes, grade papers and hold office hours. Claire Lockard, a 25-year-old third-year doctoral student in the philosophy department, said Loyola’s actions contradict its commitment to social justice. 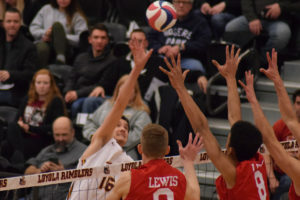 “Loyola says they are a social justice-oriented school, that they care about their students, but they are refusing to meet us at the bargaining table,” Lockard said. Benefits given to graduate students by Loyola can be taken away without warning because there isn’t a contract between them, the union has said. Kasi Woods, a 20-year-old sophomore double majoring in English and sociology, was one of the undergraduate organizers of the protest. 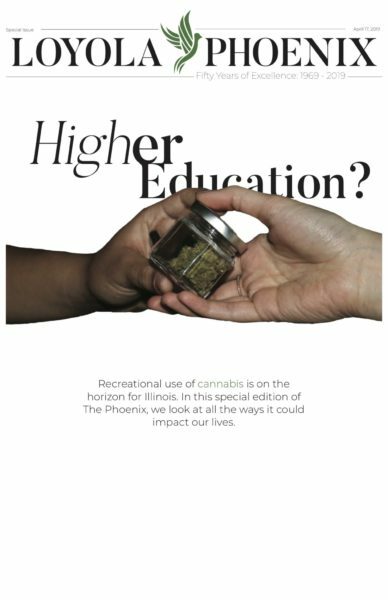 “We really just wanted to organize this because we know that the graduate workers’ working conditions are our learning conditions,” Woods, the president of ISO, said. The protest was scheduled for April 4, which marked one year since the non-tenure track (NTT) faculty union went on strike. NTT professors are hired on a class-by-class basis and don’t receive the full benefits of tenured employees. After almost two years of unresolved negotiations, the NTT union reached a contract with the university in April 2018. Ella Wagner, a 28-year-old fourth-year doctoral student in the history department, talked about the lack of benefits graduate students struggle with on top of school and work. But Tom Regan, who’s serving his second year as dean of Loyola’s graduate school, said Loyola does as much as possible to help graduate students. Regan said he took the initiative to raise their stipends to $2,000 per month, plus an additional $500 at the end of the year. For a graduate student who works for nine months, that’s a total salary of $18,500. Other benefits include lifting the ban on holding an outside job, increasing travel money for conferences and adding dental care to healthcare packages. Loyola’s spokesperson, Evangeline Politis, said the graduate workers don’t qualify as employees because “they are students in every sense of the word.” Loyola doesn’t hire students, Regan further explained. Students receive their stipends on the basis of a reward letter from the university, but they’re not employed, Regan said. Students at the protest disagreed and said graduate assistants are workers and students, not one or the other. Yiran Zhang, a 24-year-old third-year graduate student in the philosophy department, talked about how this is a campus-wide issue. Graduate and teaching assistants at University of Illinois at Chicago (UIC) agreed to finalize the terms of a contract April 12 after a three-week strike and more than a year at the bargaining table, the Chicago Sun-Times reported. The agreement was reached after the university was forced to cancel hundreds of classes due to the strike, the Chicago Tribune reported.